What a spectacular day it was celebrating the marriage of Jacqueline and Ryan. They started their day off getting ready at their reception venue, Peach Creek Ranch. The atmosphere was relaxed and everyone was giddy with anticipation for the ceremony in just a couple of hours at St Mary’s Catholic Church. We took a few bridal party photos before we left for the Church, and then we waited for the real reason we were there that day. One of the best parts of the wedding day is watching the groom’s face react to seeing his beautiful bride walk down the aisle, and man, Ryan’s was one for the ages. He held back tears as he saw his Jacquie coming down the aisle with her father. It was gorgeous! After the ceremony, family photos and bridal party photos were taken, we headed back to PCR to finish up formals of Jacquie and Ryan, and then the party began! There was a mariachi band, y’all. How cool is that?! Everyone danced the night away and hung out on Peach Creek’s awesome patio area in the cool January evening air. Jacquie and Ryan’s love was so apparent all day long. You could see how much they each put each other at ease when they were together, and isn’t that what your spouse is supposed to do? We loved this day and these people. Enjoy! 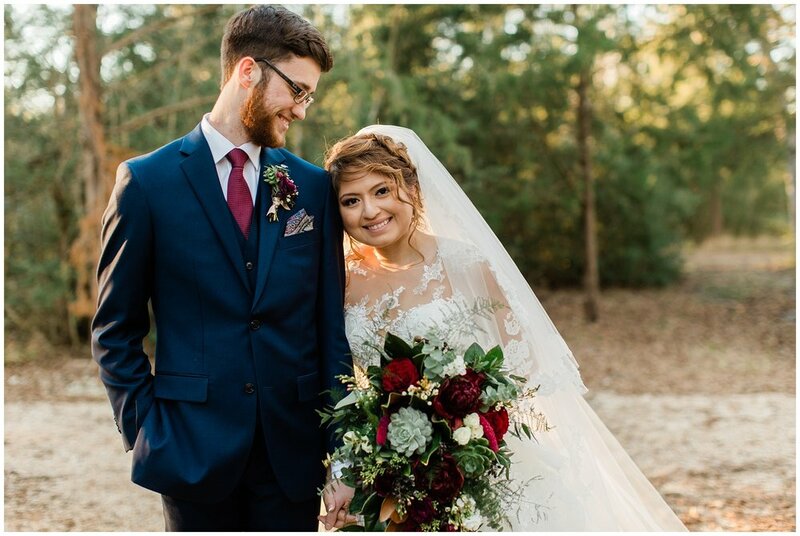 I'm so excited to share Kayla and Wayde's gorgeous spring wedding at Peach Creek Ranch in College Station! I always love heading out to Peach Creek, and this day was no different. Curtis and I celebrated our own 5th wedding anniversary with these two and their friends and family and it was an absolute honor to do so! Kayla was the sweetest and had an anniversary card waiting for us when we arrived. From the ceremony by the lake, to dancing in the pasture filled with wildflowers, and having a grand time with their loved ones during the reception, Kayla and Wayde's wedding day was as awesome as they come. Enjoy some of my favorites from their day!